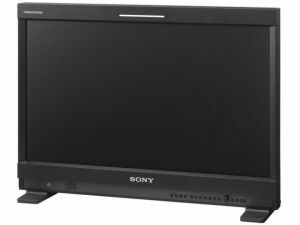 The PVM-1741 and PVM-2541 are professional OLED monitors aimed towards TV, advertising and movie productions. These monitors use the same 16.5" and 24.5" OLED panels used in the higher-end BVM-E170/BVM-E250. Both monitors offer Full-HD (1080p) support, 178-degrees viewing angle, 10-bit drivers and a 1W mono speaker. Inputs include two 3G-SDI, HDMI, composite and Ethernet. Both monitors are now shipping. The PVM-2541 costs around $5,500 while the smaller PVM-1741 costs around $4,000.